It’s that time of year again! 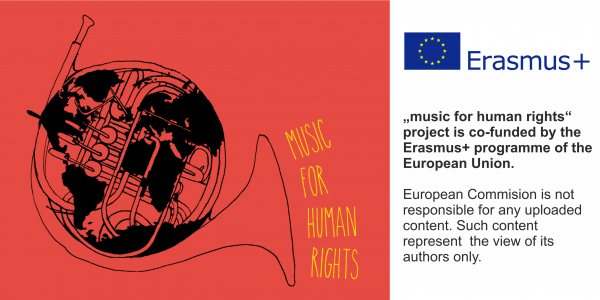 Music for Human Rights takes place in Berlin. Lots of fun, a great time, new friends, getting lost in music are some among a lot of things that 50 young people from Portugal, Italy, Serbia, Bosnia & Herzegovina, Israel experienced during 10 days of the Youth Exchange in Berlin, from 1.6.- 11.6.2018. The group is divided into two small groups of 23-25 persons. The two groups sit in front of each other. The two members from each group that are in the beginning of the line have to choose a side of the coin that someone throws. As soon as one of the members sees that the side of the coin that she chose shows up, she transmits a squeeze to the other member of the group. Each member of the group transmits the squeeze to the next one. In the end the last member that receives the squeeze should grab the ball. The last member sitting goes in the beginning and it continues like this until the person that was sitting in the beginning ends up being the last taking the ball. The group is divided into two groups. They stay in front of each-other. One group does not move at all. The other one changes place every 5 seconds, so they have the possibility to contribute in painting each member of the other group. In the end everyone ends up having a portrait, where all the members of the other group contributed. Every group had the task to create two songs connected with the topic of Human Rights, which will be performed at The Respekt und Neugier Festival. From the other side the group of media team focussed on making more visible to the public the continuation of the project. That was all about first day and team building. The next days promised adventures and lots of work too. Next Post SolFa Meetings! Time to reveal some secrets.